Origami makes me anxious. It should be a relaxing activity. Right? One of the most common origami projects is the peace crane. It should be peaceful to make one. But for me, its not peaceful at all! I glaze over while following the lengthy step-by-step directions and always do something wrong. I feel this anxiety when I do origami by myself. Imagine how I feel doing origami with children. It might be the most frustrating thing ever! My most epic failure as a teacher was thinking I could instruct over 100 fourth graders in the art of origami. When I was planning this month's author birthday celebrations I made a note next to Elise Parsley's name -- alligator origami. What was I thinking?!? I thought it would be the perfect activity for her debut picture book, If You Ever Want to Bring An Alligator to School, Don't!, because the alligator gets Magnolia, the main character, in trouble at school for littering the floor with origami. 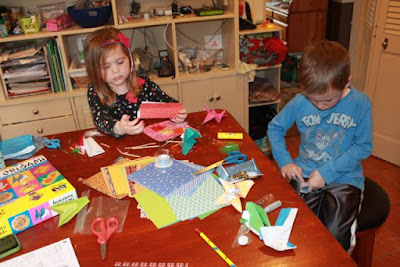 However, while practicing origami so I could teach my children I started thinking, If I ever want to do origami to celebrate Elise Parsley's birthday, DONT!. So, I started brainstorming and fiddling around with other craft activities when my son gave me a pile of his folded paper creations; a wallet, a chain of rings, a flower pot, a pocket, and something that looked like a torch. 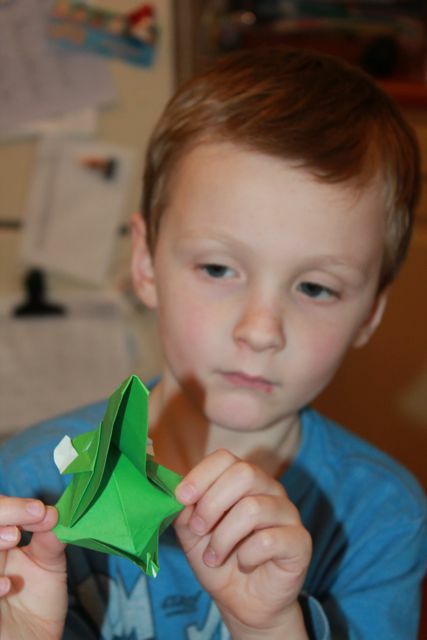 My wife said to him, "I have an origami instruction booklet in the basement. Do you want it?" He said, "Why would I use a book? I just fold paper and it turns into something." There was wisdom spoken in those words from my five-year-old. 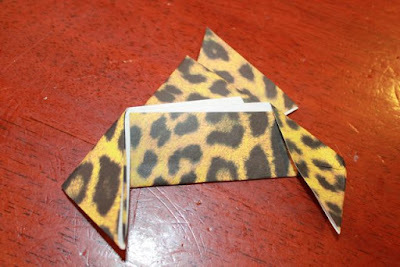 His passion for folding paper made me realize that I was being silly for fearing origami. I should just relax, fold paper, and turn it into something. Right? 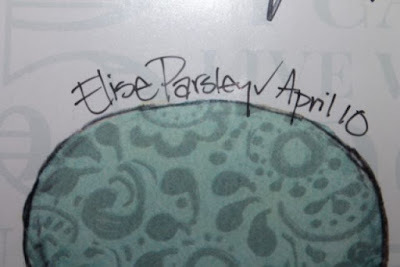 So that's what we did...but first I must tell you about Elise Parsley. 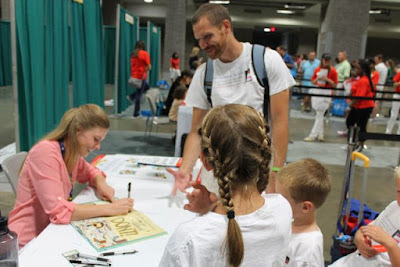 Elise Parsley is the author and illustrator of If You Ever Want to Bring An Alligator to School, Don't! and the upcoming If You Ever Want to Bring A Piano to the Beach, Don't! (available May 3, 2016). She studied drawing and creative writing at Minnesota State University in Moorhead, Minnesota. She admits that she had "no art background at all before college other than the casual drawing that everybody does." (Publishers Weekly iHeart Radio). Thankfully, she had professors at the university that "took in mind what [she] wanted to do after school" which was illustrating children's books and helped her learn to "draw from scratch." (MSUMoorhead on YouTube). After college, Elise spent two and half years working on her craft, making mistakes, and adding to her portfolio. One the pieces she made for her portfolio was of an unhappy teacher standing with a paper airplane in her hair listening to an alligator tattling on a young girl. This artwork inspired her to write story about the alligator and the girl which led to one of the most amazing book deal stories ever. If You Ever Want to Bring An Alligator to School, Don't! 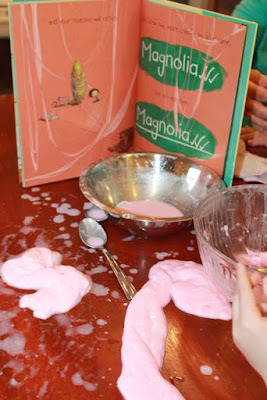 is about a girl named Magnolia who must bring something from nature to school for show and tell. She decides on an alligator and assures her teacher that he will be good. But, the alligator doesn't behave and Magnolia gets her name on the board for laughing at his funny drawings. Later, one of his paper airplanes lands in the teacher's hair as origami covers the floor. His shenanigans continue and Magnolia freaks out when he almost eats a classmate! Thankfully, Magnolia knows just how to salvage this horrible day. Well, almost salvage the day. She still has to go to the principal's office. Then, it became a free-for-all! We were folding things like crazy and our kitchen table soon looked like the floor in Magnolia's classroom. My son made this. He said it was a spaceship. It even had a movable piece on top. 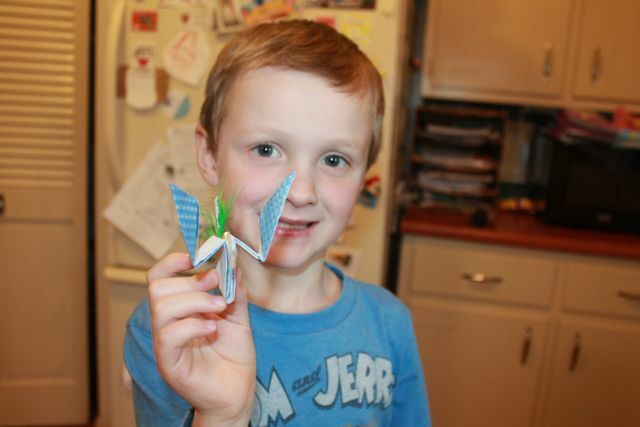 He also made a bird with a green feather. It looked so much better than my peace crane! Read this book and make origami! 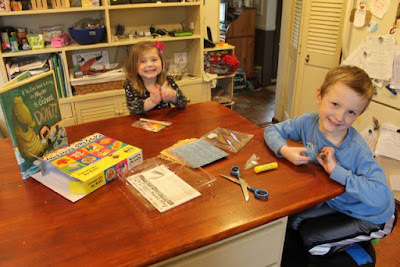 We had very peaceful time making origami but I was prepared with a backup activity just in case things went terribly wrong. There is a scene in If You Ever Want to Bring An Alligator to School, Don't! where Magnolia gives the alligator three pieces of gum to keep him from eating her classmates. The gum doesn't stay in the alligator's mouth and ends up hanging from the classroom ceiling and on the chairs and desks. The way the gum hangs from the ceiling reminded me of making slime. 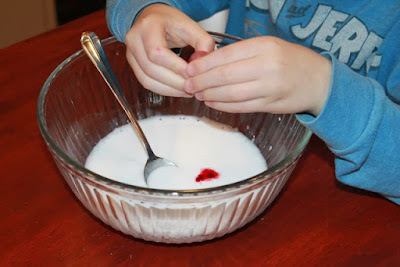 Mix the entire bottle of glue with 1/2 cup of warm water in a bowl. Add a few drops of red food coloring and mix. Dissolve Borax in another 1/2 cup of water. 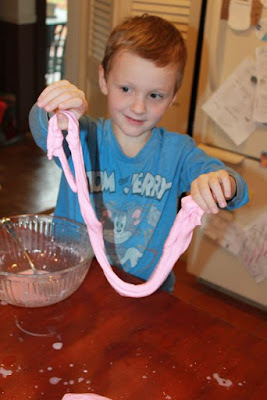 Add the Borax solution to glue mixture and stir. 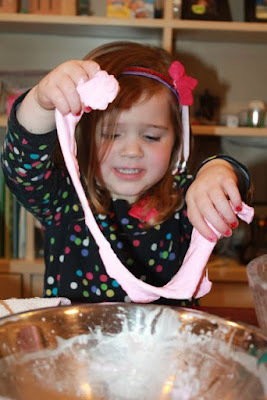 The slime can be stored in an air-tight container so you can play with it again the next day. First, we emptied the entire bottle of glue into a bowl. 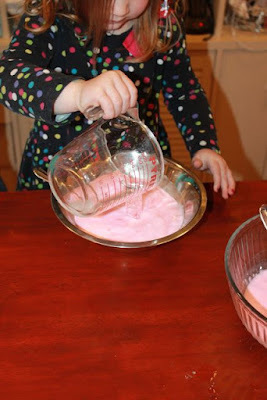 Then, added to a little bit of water to the bottle, shook it up, and added that to the bowl too. We wanted to make sure all the glue was out of the bottle. 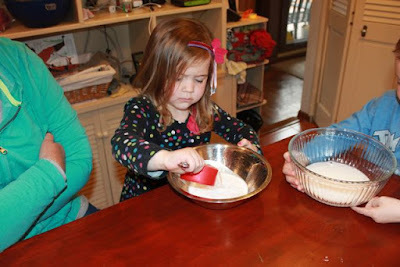 Then, we added a 1/2 cup of warm water to the glue and stirred. Then, we added a few drops of red food coloring to the glue and mixed. Lastly, we dissolved 1 tsp. 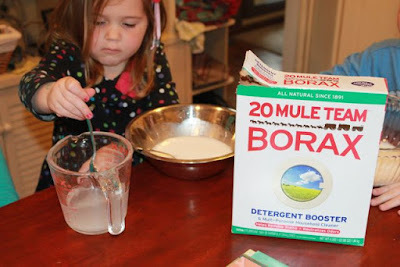 of Borax in a 1/2 cup of warm water. 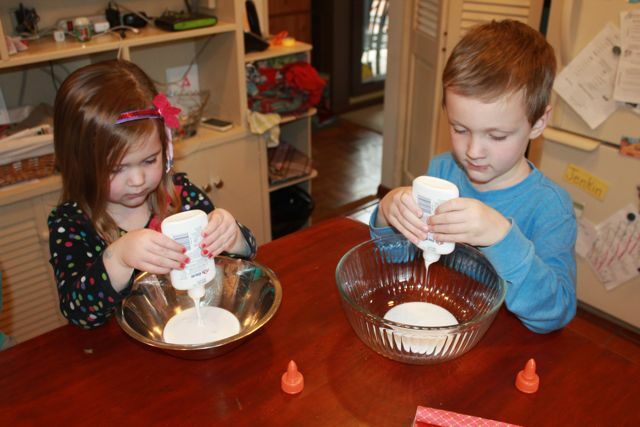 The Borax solution was added to the glue and water mixture. Immediately it looked like the alligator's favorite gum! It was awesome! 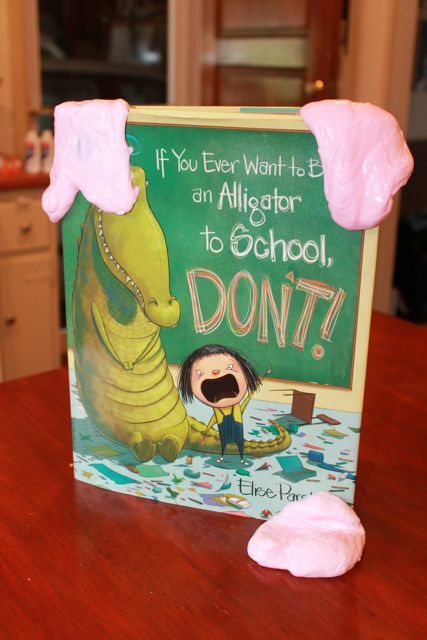 Alligator gum was everywhere even on the book! Good thing we were at home and not at school. We would have been sent to the Principal's office. 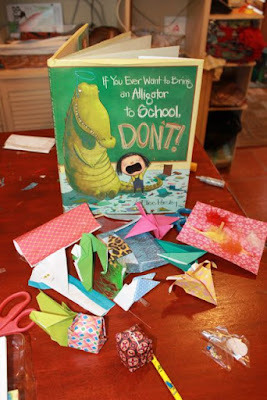 If you are thinking that you can't make origami and slimy pink alligator gum, DON'T! You CAN and your children will love it! Elise, it was so exciting to meet you at the National Book Festival. Thank you for sharing your birthday with us. We hope you have a wonderful day! We can't wait to read the next Magnolia book!